Favourite Inn was opened in February. Manager Alan and his friendly staff have quickly built up a regular local clientele. Favourite Inn is becoming a preferred choice for its Chinese customers who are seeking a traditional cuisine that few restaurants offer. 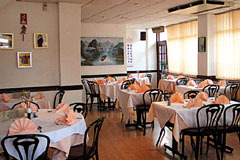 The menu includes Peking, Cantonese and Szechuan cuisine. Large selection of appetisers, a unique recipe for sweet and sour, Chinese curry, sizzling and seafood dishes - fresh lobsters and crabs are a speciality. Vegetarian dishes include Crispy Aromatic Monks Duck and Monks Lamb Lettuce Wraps. Open for lunch Mon-Fri noon-2pm. Evenings Mon-Thu 5.30-11pm, Fri-Sat 5.30-11.30pm, Sunday and Bank Holidays 6-11pm. All major credit cards accepted (not Amex/Diners). No service charge.